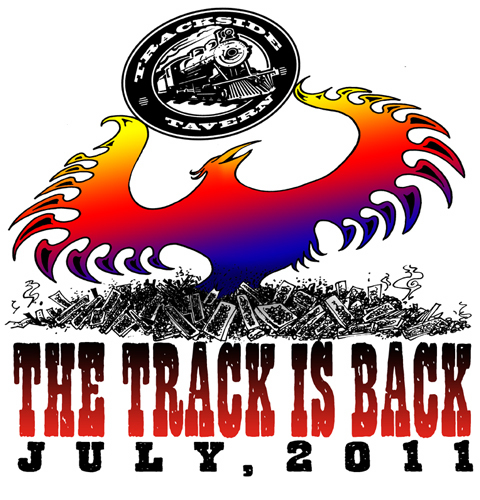 Trackside Tavern had it's Grand Opening this past weekend and this is the t-shirt design I created for Doc, the owner. It burned down January 20, 2009 and re-opened in just a couple of months ago. Neat Phoenix rising from the ashes! So how do you print t-shirts with the colors gradually going to different shades and the fine detail work? The printer broke down the gradations with a couple of separate screens. Tedious and expensive. I'm now on his "watch" list. Yet, he loved the final outcome. Make contact at my e-mail address, let's see about getting you a t-shirt a la post. This page contains a single entry from the blog posted on September 14, 2011 5:36 PM. The previous post in this blog was Assad Caricature Used in Rally!.